The Saint Demetrius Memorial Saturday was established for churchwide remembrance of the soldiers who fell in the Battle of Kulidovo. This memorial service was held for the first time at the Trinity-Saint Sergius monastery on October 20, 1380 by Saint Sergius of Radonezh, in the presence of Great Prince Demetrius of the Don. It is an annual remembrance of the heroes of the Battle of Kulikovo, among whom are the schemamonks Alexander (Peresvet) and Andrew (Oslyab). The world has found you to be a great defense against tribulation / and a vanquisher of heathens, O Passion-bearer. 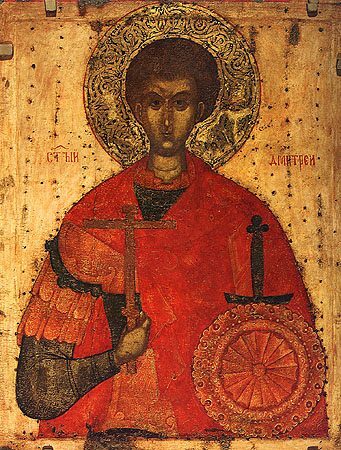 / As you bolstered the courage of Nestor, / who then humbled the arrogance of Lyaios in battle, / Holy Demetrius, entreat Christ God to grant us great mercy. God, who has given you invincible might, / has tinged the Church with streams of your blood, Demetrius! / He preserves your city from harm, / for you are its foundation!